Manchester United’s cult hero Mark Goldbridge has taken to Twitter to voice his support for Pogba after the midfielder’s reported bust-up with Mourinho. There are widespread reports in the media on Monday evening that the French midfielder has had a big falling out with the Portuguese coach, which continues the long-running feud between the two men at Old Trafford – as per BBC Sport. Pogba publicly criticised Mourinho’s tactics in the wake of the Red Devils 1-1 draw with Wolves on Saturday, which has led the 55-year-old coach to tell his star player he will no longer be used as a vice-captain, as BBC Sport also states. This latest news has been a trending topic on Twitter this evening with United fans from all over the United Kingdom expressing their opinions on the matter and one particularly notorious fan has taken the side of Pogba in this particular instance. 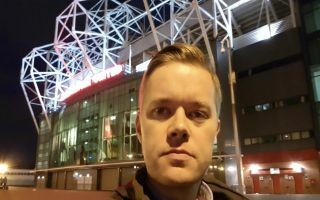 Mark Goldbridge, who has built up an infamous reputation online for his commentary on Man United games – during which he shows off his Alan Partridge-like tendencies – branded Mourinho a hypocrite in one of his posts earlier, referencing Marouane Fellaini’s current contract situation at the club. The internet sensation is the most popular Red Devils fan on Twitter and even has a fan account set up in his honour called ‘Goldbridge World’ which has over 17,000 followers. Check out that account and some of the reaction on Twitter below, along with a couple of golden videos from the United favourite doing his thing on social media. In this Pogba/Mourinho the loser is Man Utd. Pogba will go to Barcelona nd play with Messi nd win stuff. United stuck with the likes of Fellaini nd a manager with dinosaur tactics. Fans turning on Pogba saying ‘no one is bigger than the club’, that also applies to Mourinho – he isn’t bigger than the club either. If anything, everyone in the club probably agreed with what Pogba was saying but just afraid to say it. Pogba is saying what’s best for the club.